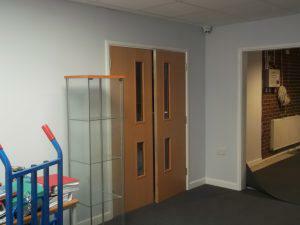 The new hall doors - yes this used to be outside! Welcome to my new blog. Here you will find up to date news and information about what is happening in school, and any events that are due. Phase 1 of the building works is almost complete. The new classroom is looking lovely. From September this will be the new Ruby Room. However as Topaz class is part of Phase 2, and will be being totally refitted, children in Topaz will be moving into the new room after half term. Here are some photos taken today of work in progress – and yes we are on track to move in on Friday! 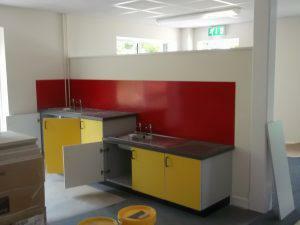 Ruby sink – just the wrong door colours which will be red asap!